Spokane, as seen from the Inlander offices on Monday morning, Aug. 20, 2018. If you've lived in the Inland Northwest for longer than the last few years, or, like me, grew up here, you've probably already had the conversation where you and your friends stare up at smoky skies and lament, "It didn't used to be this bad." But memories can be short and fallible, so it's nice when you can point to actual data to back up your point. The good news is, you're not crazy: August didn't always spell "smoke season" in these parts. At least, not since the Spokane Clean Air Agency started tracking the smaller particulate matter found in wildfire smoke in 1999, measuring it against levels deemed to be unhealthy by the Environmental Protection Agency. Prior to that, the agency only measured larger particles, such as dust, so older figures aren't comparable to current data. The bad news is, that really does mean things have been worse in recent years, and this year may be the worst. As most of Spokane and the Inland Northwest woke up to hazardous levels of particles in the air Sunday and Monday, with warnings for everyone to stay inside and limit physical activities, this year could already be on pace to match or exceed last year's "unhealthy days" due to wildfire smoke. In 2015, there were 16 bad days, 13 of which were due at least in part to wildfire smoke. In 2016, we got a break with no bad days, but then 2017 had 18 bad days, 16 of which could be blamed on wildfires. Compare that to previous years. There were several bad days in November 2002, when stagnant air helped home heating woodsmoke hang around in the air. 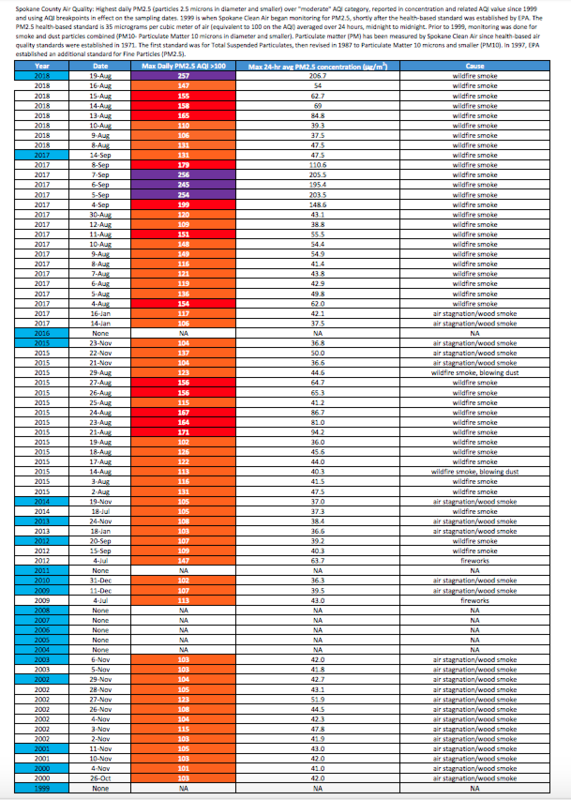 But from 2003 to 2014, six years had zero days go into the unhealthy range, with the other years only hitting the limits on two or three days total. This year has already had eight days above the limits as of Sunday, with the highest recorded Air Quality Index number since 1999, hitting 257. Monday appears to be on track to be just as bad. A quick note on those numbers: While hourly figures posted on the Spokane Clean Air Agency website showed figures in the 300s both late Sunday and early Monday, the daily index is based on a 24-hour average, so the daily figure may be much lower, explains Stephanie May, a spokesperson for the agency. "We started off yesterday in unhealthy, and then it just kind of steadily climbed up into very unhealthy and then hazardous," May says. "With the average though we ended up in very unhealthy instead of hazardous." Monday could be on a similar trend, with numbers early in the morning fluctuating in the "hazardous" zone, dipping into "very unhealthy" by lunchtime. Strong northeast winds were forecast by the National Weather Service for Monday, raising the risk of rapid fire spread, but also coming with the potential to blow the thick smoke south and away from the region. To limit possible health impacts, people are encouraged to stay indoors and limit any physical activity outside. Keep windows and doors shut and, if possible, switch your air conditioner so it cycles air within your home instead of pulling in smoke from outside. For people who might have a hard time keeping their home or apartment cool during a smoky day, as they tend to happen during some of the hottest days of the year, it might be a good idea to take a break somewhere with air conditioning, such as a public library, movie theater or museum, May says. 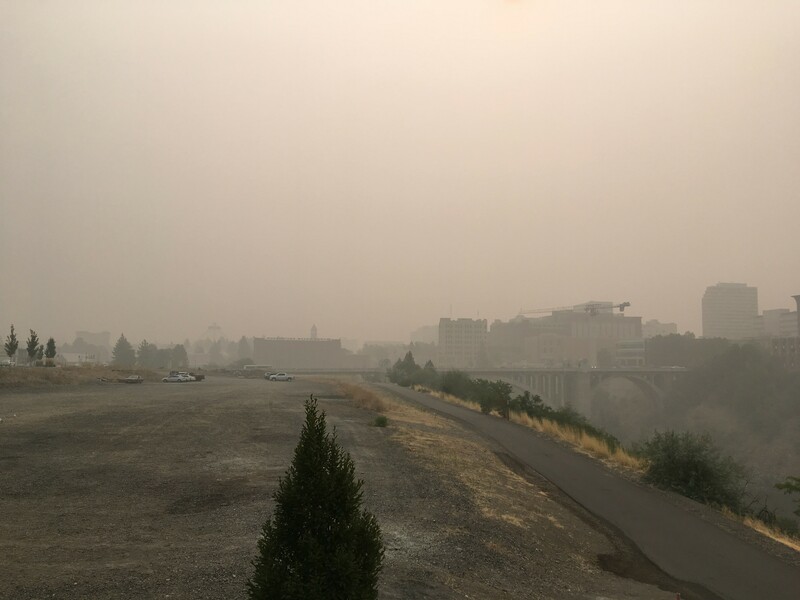 You can find comprehensive updates on the state's smoke at the Washington Smoke Blog, and more health information at the Spokane Regional Health District or AirNow.gov. This sheet shows the days in each year since 1999 that particulate matter in Spokane County air went above recommended health levels. While there are a lot of factors at play when it comes to figuring out why recent fire seasons have been worse, research has shown that firefighting activities and increasing temperatures and dryer seasons due to climate change have contributed to a recent rise in fires. That's right, the way we fight fires may actually be making things worse for us in the long run, as Oregon Public Broadcasting has done a great job reporting. As for climate change, in a 2016 study in the Proceedings of the National Academy of Sciences, researchers found that "human-caused climate change caused over half of the documented increases in fuel aridity since the 1970s and doubled the cumulative forest fire area since 1984."